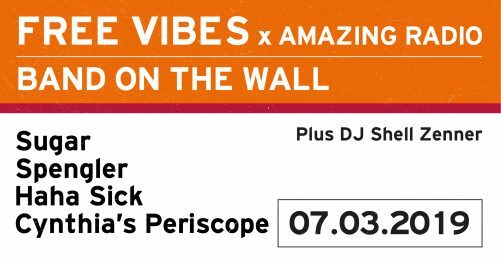 Band on the Wall presents a special edition of Free Vibes, curated with Amazing Radio’s new music champion Shell Zenner. We’ve teamed up with Shell to bring you four of the most exciting artists you need to know. Come down and discover new music from the likes of Sugar, Spengler, Haha Sick & Cynthia’s Periscope. DJ Shell Zenner will keep the vibes flowing ‘til late. Entry is free, so come on down. Click ‘going’ on the Facebook event to get all the latest updates! Manchester trio Sugar play their first Band on the Wall show. Too Many Blogs dubbed their single ‘I Never Said’ as “delicate and dreamy”. Spengler are a jazz-pop band from Manchester. Check out their track ‘Angel’. Haha Sick are a stoner-pop band from Derby! Manchester-based experimental electro-pop artist Cynthia’s Periscope brings their melodic sounds to Band on the Wall.